On Wednesday, 30 September 2009, the Israeli army murdered a Palestinian youth outside his school, the Izz ad-Din al-Qassam high school in Yabad village, west of Jenin. This school had been closed from 2001-2006. Around 11:35am, a military jeep with the license plate number 655474 left the main road to turn into the access road to the school where a group of male students gathered close to the main entrance of the school. The jeep was driving at a fast speed and targeted Foad Mahmoud Naiyf Turkuman (age 17) who was crouching down close to a small concrete wall. According to eye witnesses (one of his teachers and three of his friends), the jeep hit Foad directly and pushed him against the wall. Due to the impact, Foad was thrown 2.5 meters and fell to the ground in front of the vehicle. The driver of the jeep then drove his vehicle forward running two wheels over Foad’s chest and torso of the already injured youth a second time. He then stopped the engine and called for reinforcement, claiming mechanical failure. The driver of the jeep closed the gate of the school and did not allow any of the teachers’ cars to go out and take the injured student from the ground, or help him. A second jeep with the license plate number 611041 arrived. 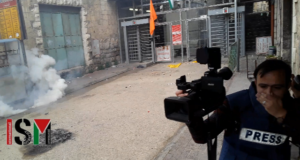 The newly arrived soldiers threw tear gas at three friends of Foad’s standing nearby as well as into the school court yard to prevent anyone from coming to the scene. About 24 students were injured by the tear gas. Eventually, the second jeep towed the first one away to underline the claimed mechanical failure. While the media portrayed the event as an accident, the Palestinians clearly see it as a deliberate murder. Some witnesses documented the event with their mobile phone cameras. When Foad’s brother, Mahdi Mahmoud Naiyf Turkuman ran to the scene to help his brother, the soldiers blocked his way. He injured his wrist when he slammed his hand against the jeep in an attempt to get through. As teachers and students tried to come to Foad’s rescue, saying that they will call an ambulance to take him to the hospital, the soldiers allegedly asked what was the problem and if anyone was injured! Foad, who was seriously injured, was left unattended for 30 minutes because the army prohibited anyone from approaching. Finally, the teachers and a relative were allowed to rescue him and take him to Jenin hospital in a relative’s private car. He died from his injuries at the hospital an hour later. His brother Mahdi had to be sedated by injection since he witnessed the murder of his own brother and was in shock. Eye witnesses mentioned that the soldiers obviously assumed that the boys were about to throw stones. Since the Israeli army is not supposed to use their guns on stone throwers, they seemed to have opted to use their jeep as a weapon instead. Most of the students were in their classes, but a few were finishing up and going to their homes. Foad’s family, who are refugees from Haifa since 1948, decided to file suit for murder against the Israeli army. The village of Yabad is surrounded by five illegal settlements, Mevo Dotan, Hermesh, Rehan, Shaqed, and Hinnanit. The Separation Wall is located west of Yabad village. Since 2003, the new road 585, located south of Yabad, is used primarily for military vehicles. Before that, the military used the old road. There is a checkpoint with 3 towers close to the school. The Separation Wall, the Israeli-only road and the illegal settlements claimed 2,000 donums of land belonging to Yabad farmers. Since 2001, a total of 40% of Palestinian land has been lost throughout the West Bank. One of the reasons why the military jeeps are coming to the area of the school is that the Israeli army is checking the water level for Yabad village once a month. Water is a serious issue here as everywhere else in the West Bank. Only 9% of the total available water resources are accessible to Palestinians, 91% are appropriated for Israeli use.